Our team upgraded to the new Gmail this morning, and we’re already feeling more productive. Our communication platform, calendar and task list used to be spread across multiples windows and screens (or drawn on our doors), which cluttered our workspace and slowed down machine performance. But the Gmail upgrade has melded many of those needs onto one screen. The quickest new features to adopt are the calendar and task sidebars. Now, you can keep your email open in one window and see all appointments or tasks to complete for the day. No more switching back and forth between monitors or tabs. 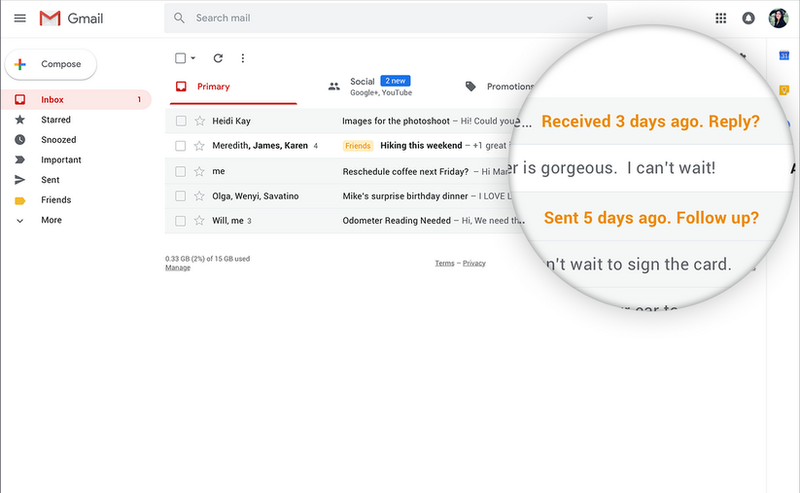 For those who receive a lot of emails, Gmail’s nudge feature will keep track of any time-sensitive emails and resurface them with a reminder to reply. Similarly, Email Snoozing will allow you to set a specific email to disappear and come back to the top of your inbox later in the day or the next morning. This is Gmail’s way of helping you make sure nothing falls through the cracks. 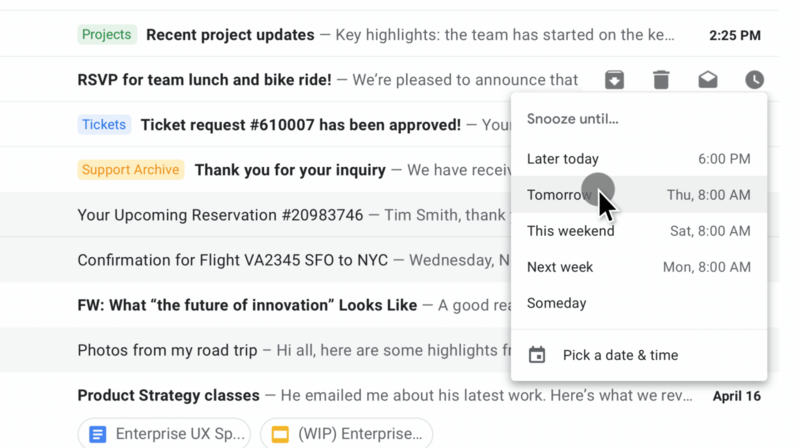 Email snooze is a function of the new hover menu, which also includes archive, delete, and intelligent unsubscribe, the easiest way to unsubscribe from an email list since they started hiding the option in 6pt font. And finding attachments is even more convenient. Any attachment appears as a clickable button in your email list. When you’re on the run or in the middle of a meeting, the Smart Reply feature provides three, pre-written messages for you to choose from. This way you don’t leave anyone hanging and you can focus on the task at hand. All these shortcuts have already come in handy within our first day with the new features, and there’s even more to explore. 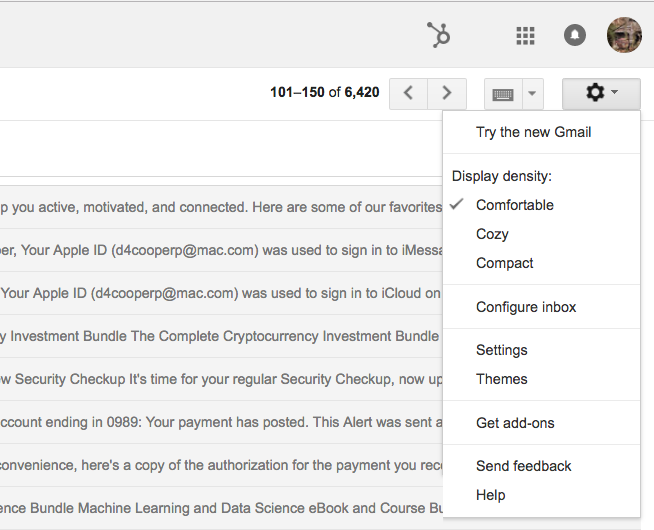 If you’re looking for more than shortcuts, Gmail has some powerful new security features too. Using confidential mode allows you to set an expiration date for a sensitive email. If that’s not enough, with the new Integrated Rights Management (IRM) you can block the forwarding, copying, downloading or printing of particular messages. And Two-factor authentication takes security even further with password protected emails. 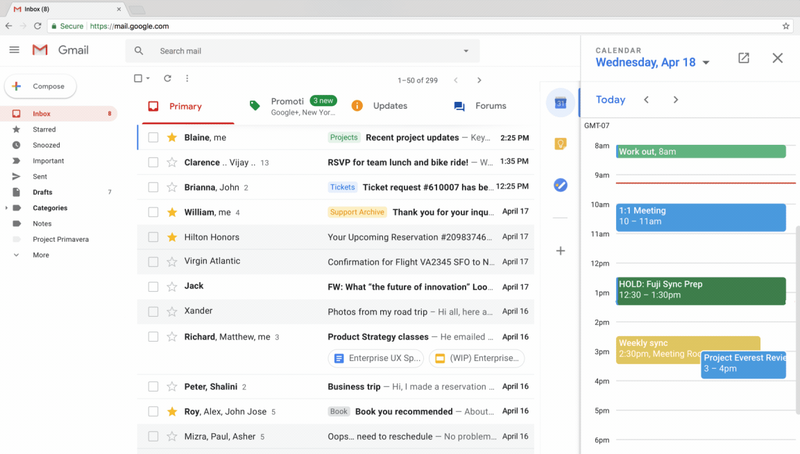 It’s not clear if Gmail was waiting to launch everything at once, but we’re happy to see so many powerful new tools. Efficiency and security are top priorities in business and even in personal interactions. With these new features, anyone can become a powerhouse. Contact us if you have any questions about using the new features, and comment below if you have suggestions, insights, or pros and cons to contribute.